Sturgill Endodontics is a practice limited to endodontics located in Johnson City, TN. This means that root canals are all we do — all day, every day — your root canal is our primary focus. 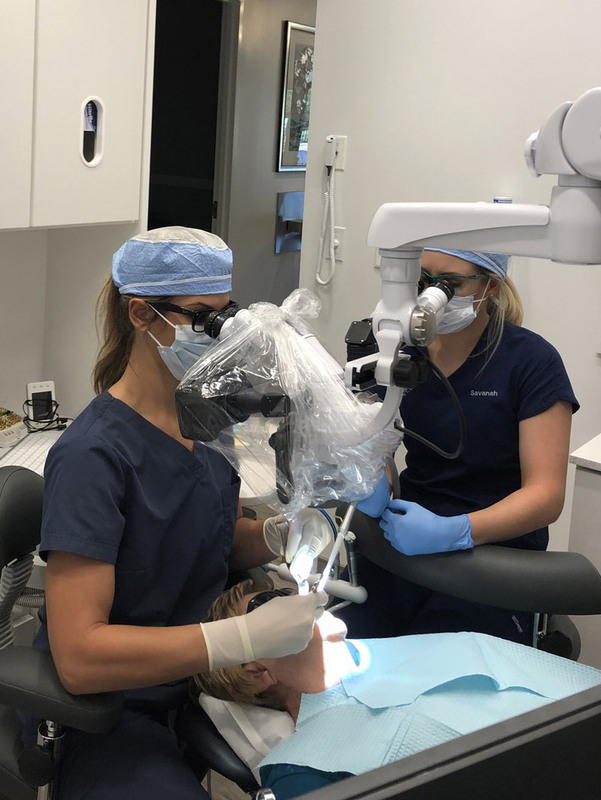 Dr. Sturgill specializes in all aspects of endodontics from conventional root canal therapy, root canal retreatments, cracked teeth, traumatic injuries, and apical surgery. Dr. Riley Sturgill enjoys working with patients of all ages, from young children to adults. She can also offer sedation in certain cases. Providing comfort alongside expertise care is her goal! Her team is caring and patient, which makes your patient experience enjoyable, while exemplary customer service also makes your day a little better. Dr. Sturgill practiced as a general dentist after finishing dental school and before returning to academia to obtain her Certificate in Endodontics and Masters of Science in Dentistry from Virginia Commonwealth University. This allows her to have a unique view into the overall treatment plan your general dentist has in mind. At Sturgill Endodontics, we work hand-in-hand with your general dentist to provide you with the best treatment for your individual dental needs. Dr. Sturgill treats root canals and provides full service Endodontic treatments to save the tooth and prevent further problems and discomfort. Dr. Sturgill uses cutting edge dental microscope and 3-D imaging technology to guide root canal treatment and ensure a successful outcome. Dr. Sturgill is experienced at finding the cause of oral and facial pain that has been difficult to diagnose. I am a general dentist and when I needed a root canal I chose to see Dr. Sturgill. Her entire team is kind, welcoming, and professional. The office and technology is state of the art. Excellent experience. Absolutely wonderful experience! Friendly, knowledgeable staff & I am thrilled with the level of care I received. I particularly adore the 4 footed greeter that makes so many patients including myself feel more at ease. I'd recommend this place to anyone!! Thanks for everything. Dr. Riley Sturgill is the best. Very kind and gentle. The office is absolutely beautiful and clean. The staff are very helpful and courteous. I would recommend Sturgill Endodontics for anyone needing a root canal. Dr Sturgill and her staff are the best! She and her staff are professional and meticulous in what they do. She was very detailed in explaining what she was doing and why. No one enjoys a root canal but she made it a lot easier and completely painless. The office is lovely. She even brings her sweet therapy dog to the office daily. Her gentle golden retriever is a friendly addition for comfort and relaxation. After being in severe pain for several days, I finally went to my dentist who referred me to Dr. Riley Sturgill. I was amazed at how accommodating their office was right from the start. Knowing I needed to get in quickly, Michelle, the office manager, called and worked me in for that very next day. The EXCELLENT service I received from everyone in that office as impeccable! I have had root canals in the past, but this one was simply relaxing and I feel great the day after. Thank you Dr. Sturgill for everything you have done for me! I certainly would recommend you to anyone needing your care! Dr Sturgill is a very knowledgeable and competent endodontist. She is also very compassionate and caring. I was extremely satisfied with the root canals she performed and would recommend her to anyone. She also works well with her assistant and office staff. I will definitely use her in the future.